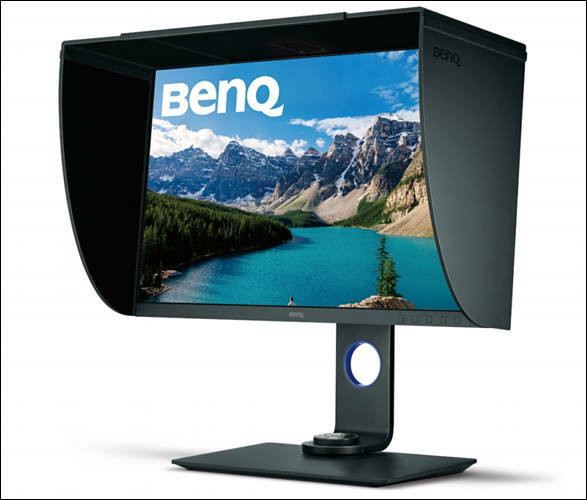 BenQ, internationally renowned provider of digital lifestyle devices, today launches the SW271, a 4K UHD 27” monitor offering industry-standard HDR10 support and advanced colour performance for photographers. Covering 99% of Adobe RGB, and 100% of both sRGB and Rec. 709, the SW271 delivers the ultimate colour accuracy of Delta E ≦ 2 performance with its 10-bit IPS panel and advanced 14-bit 3D lookup table (LUT). To display individual colours across its broad colour gamut with perfect accuracy, the SW271 utilises an advanced 14-bit 3D LUT to achieve Delta E values of two or better. In addition, Technicolor ® Colour Certified has been installed to meet strict colour accuracy standards used in Hollywood and entertainment media, therefore the SW271’s 10-bit 27” IPS panel delivers authentic colours as envisioned by content creators. SW271’s colour characteristics can be customised via hardware calibration with X-Rite or Datacolor calibrators and BenQ Palette Master Element calibration software. Equipped with USB Type-C TM connectivity, the SW271 requires a single cable for calibration and video transmission. Adobe RGB, sRGB , as well as Black and White modes can be switched instantly via SW271’s exclusive “Hotkey Puck”. In addition, standard-equipment detachable shading hood blocks ambient glare for professional work in both portrait and landscape orientations. GamutDuo Mode also enables simultaneous picture-by-picture operation in two different colour spaces, such as Adobe RGB and sRGB, or even in a black and white film effect. SW271 is equipped with understated functionality with height adjustability, an SD card reader, USB 3.1 (Gen 1), USB Type-C TM , HDMI 2.0, and DisplayPort 1.4 ports.